Gladys Camacho kan lingüista Cochabambamanta Boliviamanta. Kay podcastpi iskay andino ñisqa willaykunata willariwanchik. Ñawpaq willaypiqa, Gladys iskay llulla wawakunamantawan unqusqa mamankumantawan willariqanchik. Qhipan willaypiqa, Gladys atuqmantawan kunturmantawan willariwanchik. Gladys Camacho es una lingüista boliviana de Cochabamba. En este podcast nos relata dos cuentos clásicos andinos. En el primer cuento nos relata sobre dos hijos mentirosos y su madre enferma. Seguidamente nos relata un cuento sobre el zorro y el cóndor. Gladys Camacho is a linguist from Cochabamba, Bolivia. In this podcast she tells us two classic Andean stories. The first is a dramatic tale about two sons who lie to their sick mother and suffer the consequences. The second story is about the adventure of a condor and a fox. 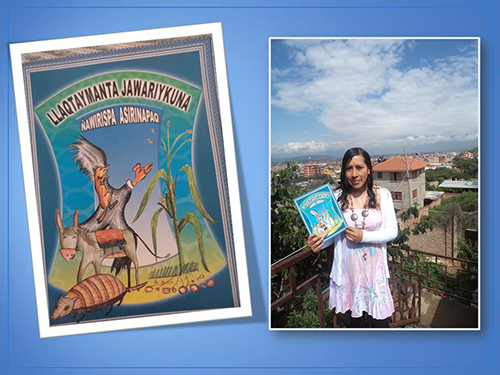 This entry was posted in Rimasun and tagged andean tales, Bolivian Quechua, Cochabamba, Cuentos en Quechua, Indigenous, linguistics, Quechua, Rimasun. Bookmark the permalink.